Open year-round down on the beach, Lucky Beach Cafe serves up some of the best food in Brighton. Local, sustainable and mostly organic food and drink right in the middle of Brighton beach. We have the highest rating from the Sustainable Restaurant Association and as such, work to reduce our footprint to an absolute minimum whilst supporting local farmers and small businesses. We use native breed organic sussex beef for the hamburgers which is grass-fed and dry-aged. The fish is landed locally here in Brighton and delivered fresh every morning. The Chicken and pork is all local and free range. We're spreading our wings inland, so when the perils of the beach are all a bit too much you can find us here in the warm of Temple Bar. 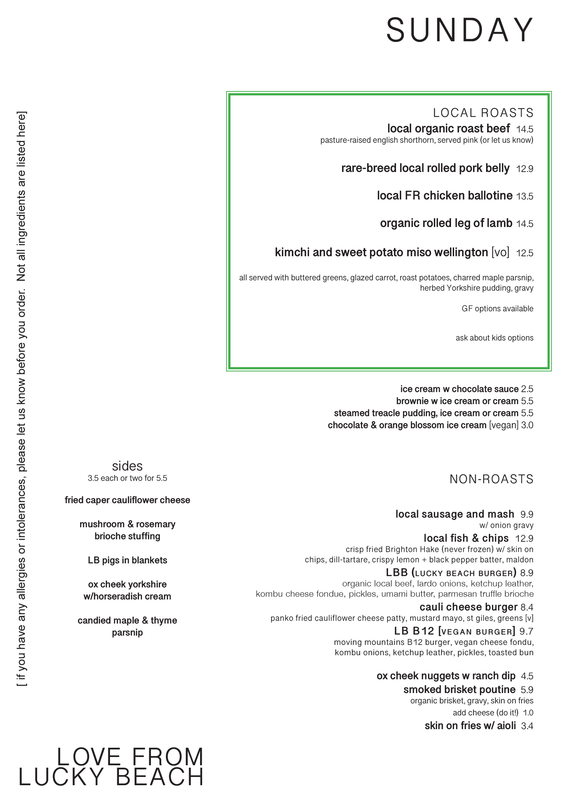 Offering a similar menu, with just as much care and attention to our sustainable ways, with the odd pub touch, including delicious Local, organic Sunday Roasts & Taco Tuesdays and 'our take' on bar snacks, along. So for all your late night LB burger needs we’re serving seven days a week 12 til 10pm.